From all sections of Germany 64 pokerplayer traveled to Baden-Baden at the end of the year. Except the title defender Ahmet Koc from Berlin, everybody had to qualify in an two days lasting elimination for the final. There one could win 250.000,- DM. An opportunity in the Advent season to improve the own annual balance. Casinodirector Verschl welcomed his guests in the cure city in the evening. At 20 o’clock the championship began at 8 desks under the prudent line of Mr. Jörger and Mr. Ludwig. Everyone started with 6000 jetons. The limit structure was identically to the preliminary round and now it was played „Freeze Out“. The first separated relatively early and as the tournament was interrupted after 3 hours, already further 13 were separated. Very heavy was it for the player with Ranzi Al-Khitib at the desk. 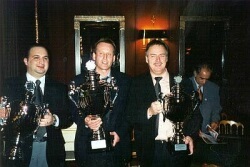 One after the other went against him ALL In, among them also the earlier champ Robert Zipf. 38.000 jetons meant the chipleaderposition for Ranzi. However he did not come quite forward. Later he unfortunately separated as the ninth. 3 aces were not enough for getting ahead. There was a common dinner on Saturday for the remaining 41 players to the second round. An ante of 200 and the spread limit 400-2000 brought fast many participants into critical situations. Brutally hard these increases. Now also large dying began!! Luck and „stealing“ were in the focal point and after a good hour the hall was almost empty. Only 16 participants in the play!! On the distance remained also the previous year master. Many could not hide their disappointment. However Rolf Dieter Eibel put the foundation-stone for later success in this phase. He succeeded again and again against different contractors. Almost without exception thereby his aces were in the focal point. At 22.30 o’clock 8 men had achieved the ambitious intermediate objective, the final table and thus the price ranks. 384.000 jetons were well distributed, whereby Eibel had the main part of over 100.000. It prevailed under large interest of spectators a strained atmosphere. Each stake, each raise, each All In was well considered and also the dealer adapted to this high level of the players. Later Mario Bentivedo, Nguyen, Thang Duc and Anis Sanbar followed the short appearance of Mohamed Fioruzi, who Rolf Dieter showed his already mandatory 2 pair of aces. Ever more Pouya Pouyamajd and Erik Jensen shifted now into the foreground. Jensen was it then also who threw Bernhard Wollert (jacks and…) with aces and 6 from running. For amusement provided then Pouya. He left briefly the desk, saw with the return to his place the open king and blindly still increased in runnung by. He got this pot combatless. It was already speculated by the public whether Pouya and the Dane Jensen could pressurize again Eibel. All prepared themselves on a packing final. The contrasts could not be more largely. Two experienced profesionals against an amateur. Then suddenly discussions at the desk under the three and after tough negotatiations agreed them on a deal. The action was now away, almost 200.000,-DM divided, it only still went around the title. Many experts were surprised that Eibel agreed, because he had nevertheless almost 70% of the entire jetons. He played however unimpressed. So also in the crucial coup against Erik. When the Dane had already kings with 6 against a pair of seven of Rolf Dieter, came with the last card against a second ace. As last hurdle was now still Pouya before him. After several All In´s and energetic resistance he took however also these. Briefly after midnight the decision felt. Triplets ladies were for the radiating new master a worthy termination. In the following interview with the ISA-CASINOS he was still completely in the the spell of the happening. The 48-year-old man from Stuttgart plays only few tournaments. Privately, from time to time with friends a „small play“. He is married, has 2 children and makes much sport. Pleasing that with him an almost unknown quantity „outsider“ could succeed in a nevertheless strong player field. 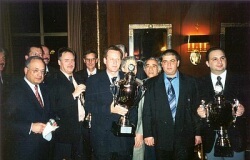 The ISA-CASINOS congratulated him and also the other winners quite cordially. About the delivering mode of this German championship was already spoken plentifully in the apron. Further discussion material was added surely now in the 2 days, which were brought by the supervisors nevertheless well over the rounds.